It’s been more than 15 years that I have been looking at India for inspiration and one of them has been Mahatma Gandhi as I believe in many of his thoughts and teachings. To this day he inspires millions and a gift commemorating him is exchanged by people of all faiths and cultures across the world.It started from a simple bookmark in the silhouette of Gandhiji , then the round spectacles, handspun Khadi-bound journals a little later, gifts for the Indo-African summit commissioned by a private organisation which included salt from Dandi and soil from Porbandar neatly packaged in recycled wood boxes and finally this; Charkha prototypes in wood and metal. 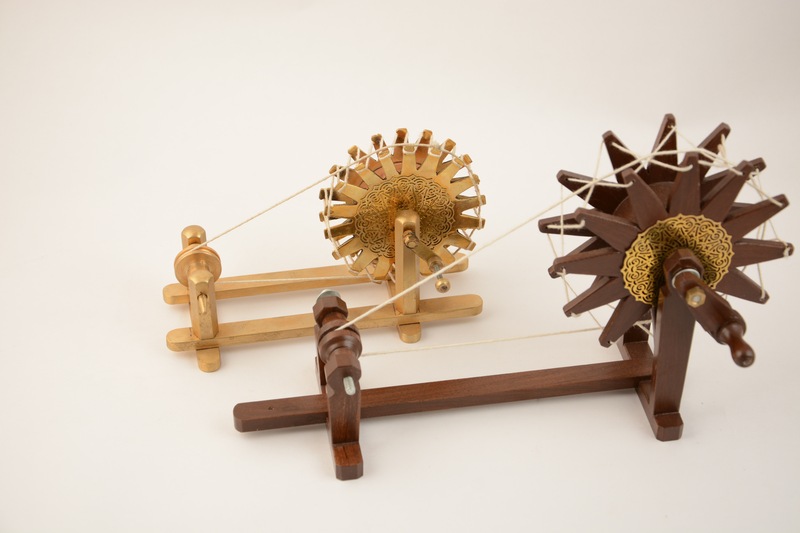 My charkha’s have functional parts that rotate. These are the first prototypes and I am now awaiting final improvised pieces. In the last few months, Sabarmati Ashram has started retailing our Mahatma Gandhi souvenirs and in the coming months we will be working closely to develop more. I am working on a 99 pieces signature limited-edition boxes that will contain a charkha, pocket watch, salt from Dandi and Khadi handspun on a wooden charkha, I may also include his three monkeys and wooden clog. Like always, there is no timeline, it may be this season, next year or sometime in the future. It is one of the many ideas that my team is currently working on. This entry was posted in Whats New and tagged Anand Prakash, Charkha, Dandi, Mahatma Gandhi, Porbandar, Sabarmati Ashram. Bookmark the permalink.